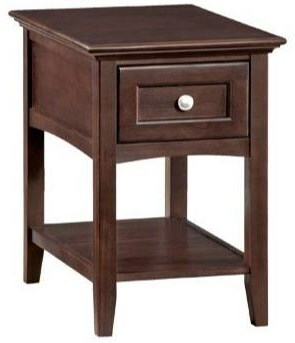 The McKenzie Chair Side Table by Whittier Wood at HomeWorld Furniture in the Hawaii, Oahu, Hilo, Kona, Maui area. Product availability may vary. Contact us for the most current availability on this product. 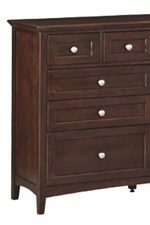 Composition Description Solid American Alder hardwood & Alder veneer wood, Finish: Caffe or Glazed Antique Cherry, Solid plank top. Storage English dovetail drawer construction, Full extension ball bearing slides, Adjustable glides, CD/DVD Storage.